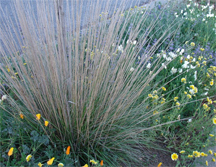 This native California ornamental grass has something for everyone. Its common name is deergrass, but deer generally do not care for it. Soil preference? Quite adaptable. Water? It likes Sonoma County’s winter rains and takes little or no irrigation during the summer; but if you give it some, it will be happy. Light exposure? Likes sun but can take some partial shade. Maintenance? You can cut it back or not. Invasive? No. 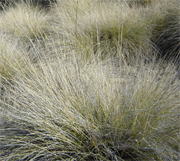 Along with Muhlenbergia, California has many other native ornamental grasses: Bouteloua gracillis, Festuca californica and F. idahoensis, many sedges (Carex), Deschampsia caepitosa, Leymus triticoides, and Nasella pulchra (our state grass), to name a few. We call these grasses “ornamental” to distinguish them from mowed turf grass, but also because seeds have been collected from the wild, grown and domesticated, and the grasses are now used in a wide variety of landscape settings. Since these grasses were born and have lived here for millennia, they appreciate our Mediterranean climate and have a close working relationship with the native birds and beneficial insects. And because the grasses are so regionalized, you will find little to no reference to them in some of the finest horticulture books (see references below or just Google). Though Muhlenbergia rigens is not indigenous to Sonoma County, it does range from Shasta County south to the Mexican border, as well as in Texas, New Mexico, and Mexico. It is generally found below 7000 feet in valley grassland, chaparral, yellow pine forest, and wetland-riparian plant communities. Historically, its long stems have been used by many Native American tribes for coiled baskets or the seeds ground and used with corn meal for bread or mush. 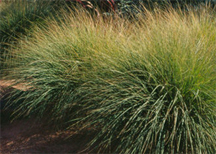 Muhlenbergia rigens is a warm season, evergreen perennial bunch grass with narrow pointed leaf blades; its form has been called both mounding and clumping. Its color ranges from light silver green to bright green to purple. Its center spikes can reach heights of four feet, with its outer leaves arching and spilling downward, to resemble a fountain. Blooming in late summer, its whitish plumes can rise two feet above the plant, creating a dramatic display as a single species or massed in drifts. This is a fast-growing grass that can reach maturity in two seasons. You’ll see it used in both private gardens and as a primary landscape element in commercial and business park settings. One of its finest characteristics is that it does not “seed around” and become invasive like pampas grass (which can take over yards, roadsides, and vineyards). Deergrass is tidy and well-behaved! In a more formal setting, cut it down to 3” in winter, but in a more natural environment, it can go for years without pruning. You can also groom it occasionally by pulling out the dead stalks and stems with a rake. Though deer do not usually forage on deergrass, rabbits and ground squirrels have been known to nibble on young plants; protect as needed. Dramatic in every respect, its uses vary widely. Combine it in natural plantings with other grasses, boulders and natives such as goldenrod, buckwheat, milkweed, and coyote brush. However, planting it too close together will detract from the beauty of its form and color. Remember, it is generally for sale as a tiny specimen in 4” pots but its mature spread is 4’! Create a meadow, combining deergrass with prairie flowers like black-eyed Susan, gaillardia, and coneflowers. Mass it in parking strips or near a swimming pool. Or use it on embankments and slopes for erosion control. A clump of three, planted so that their individual forms are distinct, can be as dramatic an accent planting as a specimen shrub. Deer grass seed can be started in flats in May and then put in the ground in early Fall. After a few years, established plants can be divided during winter months, using a sharp spade, and transplanted elsewhere. Deergrass is available (as noted above, generally in 4” or 1 gallon containers) at many local nurseries, especially those with good selections of grasses or natives, such as Emerisa Gardens in Santa Rosa, Mostly Natives in Tomales and Cottage Gardens in Petaluma. East Bay Municipal Utility District, Plants and Landscapes for Summer-Dry Climates for the San Francisco Bay Region, 2004. Rushing, Felder, Tough Plants for California Gardens, 2005.